Awhile back, I posted a short description of how auger technology is widely used for moving granular materials, and in particular, for unloading of covered hoppers with such cargoes. (That introductory post can be found at this link: http://modelingthesp.blogspot.com/2017/11/unloading-covered-hoppers.html .) In particular, I showed a pair of photos provided to me by Clark Propst, extremely helpfully showing a close-up of such an unloading auger. I show below a repeat of an image from the previous post, a detail of the 1949 photo that Clark sent to me. You can see how narrow is the auger pit (looks like maybe the equivalent of one missing tie or a bit more), and a good look at the auger mechanism, as visible from ground level. 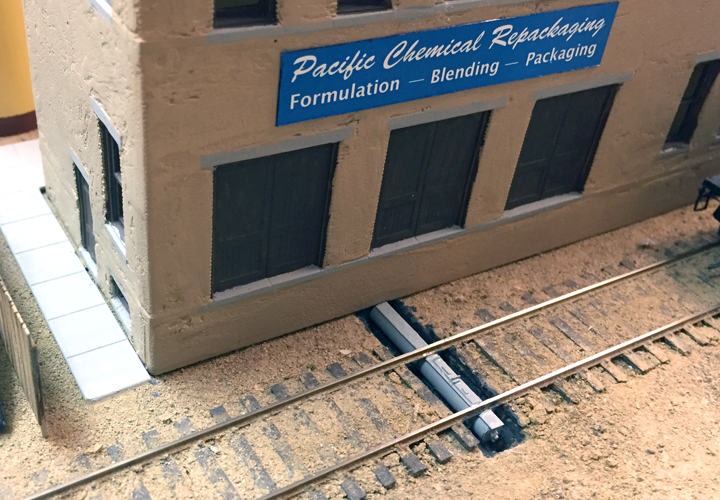 I wanted to include such an auger pit at my Pacific Chemical Repackaging (PCR) plant at Ballard on my layout, because some granular chemicals are delivered there. I began by choosing a location in the area alongside the PCR building, then digging out a tie and the underlying Homasote to an adequate depth. There won’t be any detail in the trench aside from the auger itself, so no need to create a fine finish here. 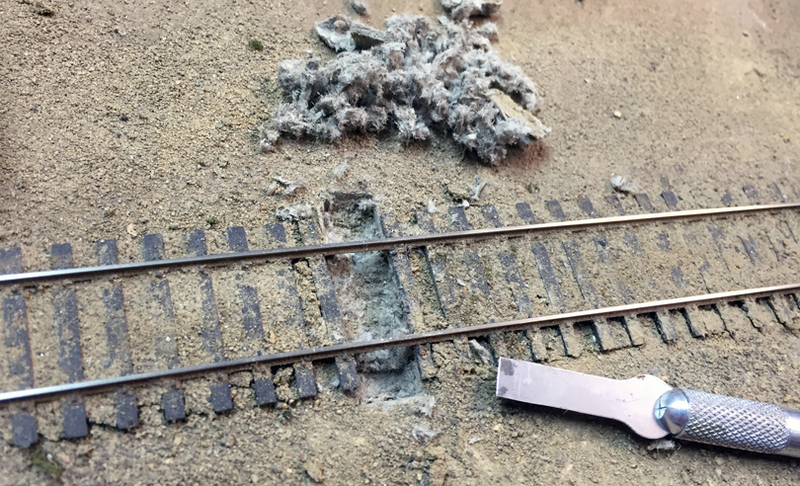 For the cutting into the sub-roadbed, I used the chisel blade of the hobby knife,to help make smooth, vertical sides to the pit. This only needs to be about as deep as it is wide (the auger body is round). The removed Homasote is so fuzzy, the pile of debris looks far larger than the pit. Next, I painted the interior of the pit Dark Gray, though a concrete color would probably also serve. In the prototype photo above, it is unclear what the walls of the pit look like. With the pit opened up, I chose to use Evergreen 3/16-inch tubing (item 226) for the auger tube, and cut it to fit the trench. (There is no requirement for using tubing here, of course, even though the prototype is a tube; solid rod would work exactly as well.) I added a strip of scale 1 x 10-inch styrene strip to the top of the tube (Evergreen no. 8110) and closed the end. I added a large nut-bolt-washer casting on the end, chosen from my parts stash of Grandt Line NBW’s. My idea was to paint the sides of this (I used Model Master “Light Sea Gray”), but not the top, before inserting into the pit. 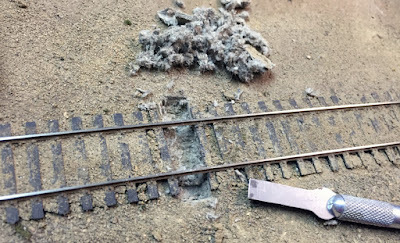 The flat top was then glued to the bottom of the rails (see prototype photo), so any detail on the top of the auger needed to be glued in place after placing it in the pit. I’m not sure what the two items on top of the auger are, in the prototype photo, probably a pair of connections to the car’s par of outlet openings, so I cobbled up something to look like these receivers. I used pieces of scale 1 x 6 and 1 x 2 strip. A view of the modeled auger, in the pit and glued to the rail bottoms, is below. The company building lines up with the back of the pit. I felt that this looked satisfactory, so I went ahead and tried it with the structure in place. As I have already said, I owe considerable thanks to Clark Propst for providing a very informative and stimulating photo of a prototype auger in place. Though mine is far from an exact model, it will serve its primary purpose: to show switch crews where to spot covered hoppers for unloading! as well as providing some credibility for this spur as a destination for that kind of car.